Pantone, the leader in developing colors for textiles, graphic arts and decor, has named “honeysuckle” as the official color of 2011. “In times of stress, we need something to lift our spirits. Honeysuckle is a captivating, stimulating color that gets the adrenaline going – perfect to ward off the blues,” explains Leatrice Eiseman, executive director of the Pantone Color Institute. Sounds like a perfect, uplifting color for a wedding! 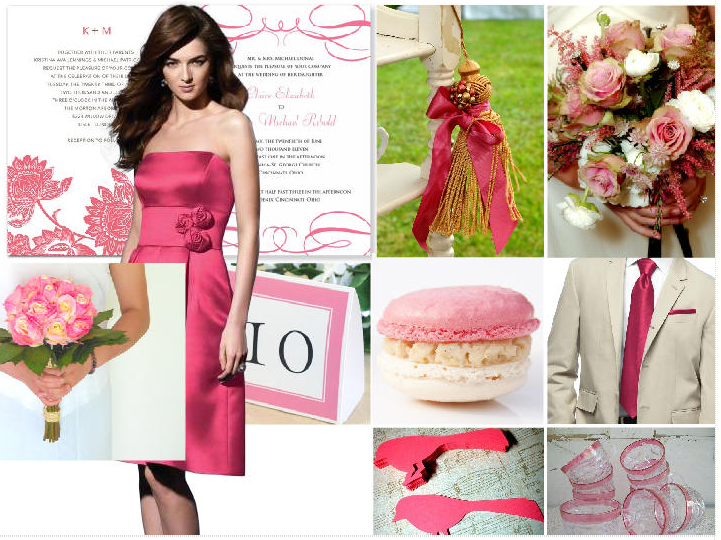 We predict seeing this vibrant pink in many upcoming spring and summer weddings, and have developed a few color combination’s to help our future brides choose fashionable color schemes. Honeysuckle and gray: this color combination gives the wedding a soft, romantic feel. Both beautifully compliment white tables and décor, as well as the color green, and are perfect for an outdoor wedding. Feminine bridesmaid dresses in a muted gray or fun, flirty bridesmaid dresses in a vibrant honeysuckle are perfect for this wedding, and the theme is a great way to incorporate soft gray suits for the men. Honeysuckle and black: perfect for a romantic, classy indoor wedding, this vibrant combination screams “black tie” and “modern elegance”. 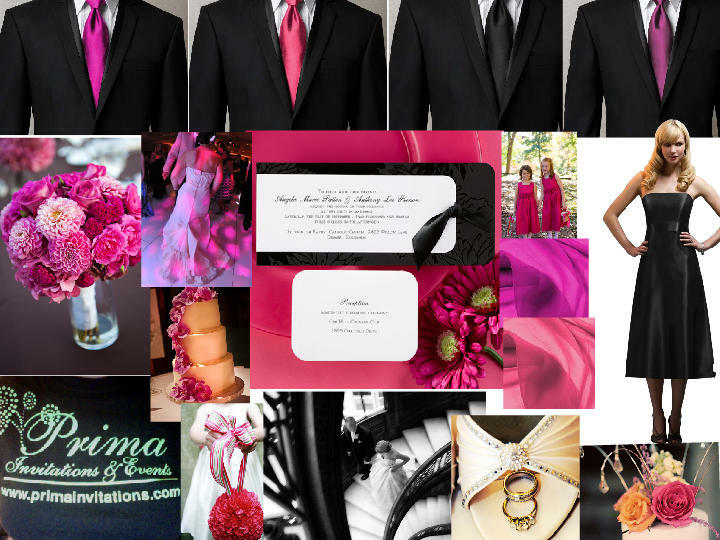 Sleek black bridesmaid dresses and tailored black tuxes are excellent additions to this this classy event. 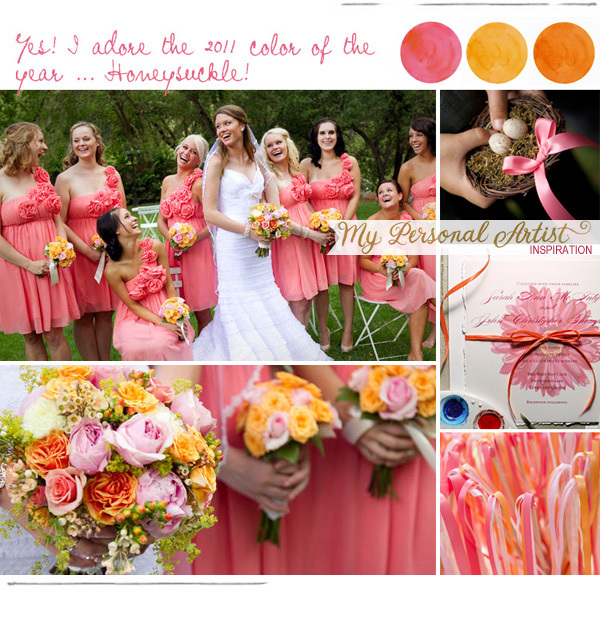 Honeysuckle and coral: a beautiful choice for a vibrant spring wedding, these colors open up the possibilities for floral arrangements in an array of pinks and oranges. We picture apothecary jars with orange slices and pink flowers submerged in water and fun, silk runners with gold accents. Honeysuckle and chocolate: for a lush, chocolate wedding, combine honeysuckle with deep browns that have a pink hue. Carry the chocolate theme into the menu with chocolate treats. Honeysuckle and navy: Kate Middleton’s navy dress and sparkling engagement ring have been all the rage, and we predict to see a lot more navy in weddings and in fashion this year. Coincidentally, navy is one of the colors that Pantone suggests to pair with honeysuckle. 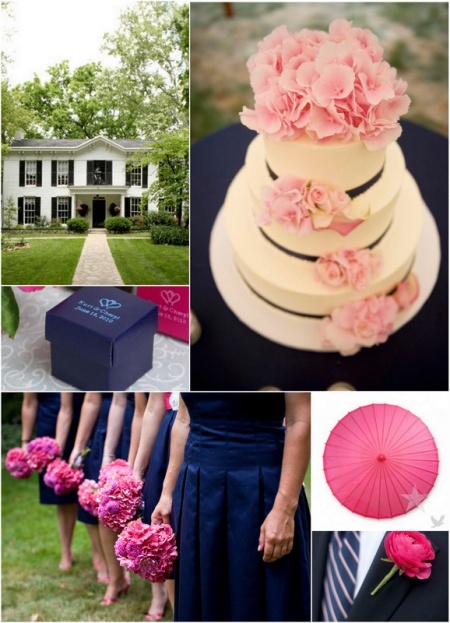 Substitute classic black for navy hues to create a wedding with a unique style and flare. 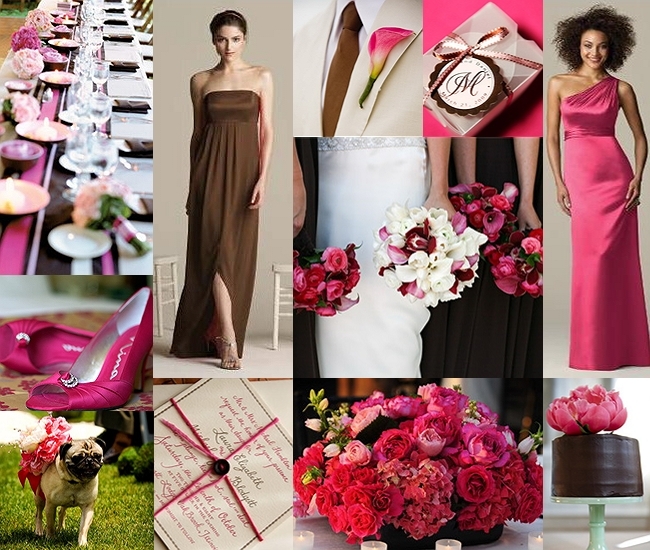 We love how versatile the color honeysuckle is: from fun, casual outdoor weddings to black tie affairs, it truly is the Color of the Year for a reason: it is a beautiful, vibrant and lush shade of pink that screams “love” and “happiness”. Best of luck to all of our brides who are in the process of choosing their wedding color scheme! As always, remember to choose colors which are a reflection of you as a bride and of the two of you as a couple. And have fun with the creative process of choosing your colors and décor! You are so awesome! I don’t believe I have read through a single thing like this before. So wonderful to find someone with a few original thoughts on this subject. Really.. thank you for starting this up. This website is something that’s needed on the internet, someone with a little originality!